Capture User Experience with the latest UX research tools. Noldus provides both UX testing tools and complete user experience labs. Viso®: state-of-the-art solution for creating A/V recordings. FaceReader™: premier automated system for recognition of facial expressions. CubeHX: revolutionary new tool for UX research. Easy integration with eye tracking data and physiology data. User experience (UX) is the overall experience of a person using a product such as a website or computer application, and his or her emotions and attitudes while using this particular product, system, or service. UX research focuses on discovering and understanding behaviors, needs, and motivations of users through observation, task analysis, and other feedback methodologies. Reliable data is very important for user-centered design processes. While you observe the user of your product, you can receive direct feedback about your product. Is it being used in the way you meant it to, or does it need to be adjusted? 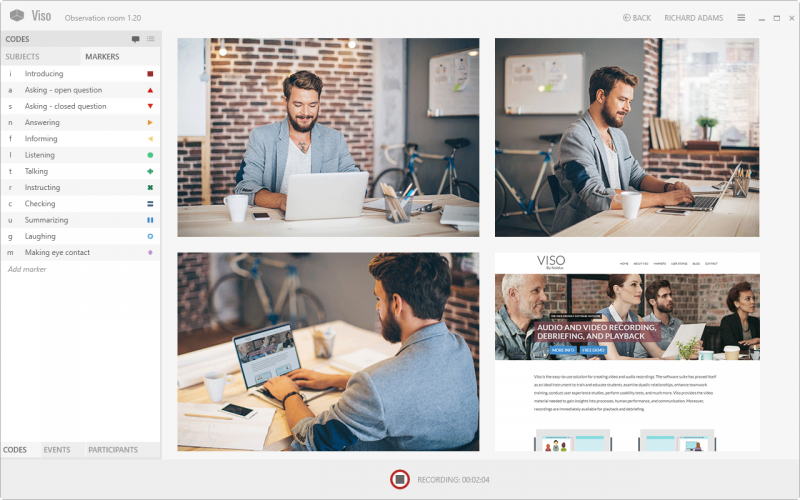 Viso is the easy-to-use solution for creating video and audio recordings in order to capture the user experience of your test participants. The software suite has proved itself as an ideal instrument to perform usability tests and conduct user experience studies, enhance teamwork training, and much more. FaceReader is the most robust automated system for facial expressions analysis, and the recognition of a number of specific properties in facial images, including the six basic or universal expressions: happy, sad, angry, surprised, scared, and disgusted. Additionally, FaceReader can recognize a 'neutral' state and analyze 'contempt'. The software immediately analyzes your data (live, video, or still images), saving valuable time. The circumplex model of affect describes the distribution of emotions in a 2D circular space, containing arousal and valence dimensions. FaceReader is the most reliable software tool for facial expression analysis (source). "After considerable research, it was clear Noldus Technology was the only option to turn our vision into reality. By delivering a deep-dive into the user experience, Noldus helps us ensure our clients and their services reach the right audiences at the right moment." Eye trackers add substantial power to your lab set-up. They produce gaze path video and large quantities of rich data, all related to attention and emotion. Take advantage of our experience and knowledge: as we often integrate eye trackers into lab as well as portable set-ups, we can help you find the eye tracker that works best for you. We will assist you in the process from start to finish, including lab installation, training your team and setting up experiments, and creating custom scenarios. See what your test participant is looking at. Get rich, quantitative, and reliable data for attention, mental load, and arousal. Combine eye tracking videos and other sources like FaceReader™ or data acquisition systems with The Observer® XT. Benefit from a completely integrated system. Prof. Pierre-Majorique Léger: "Help designers to design new and better products." Efficient UX data insights with Cube: a revolutionary new tool for UX research. Prof. Pierre-Majorique Léger tells about user experience research and how to measure users' interactions with technology. A UX Lab is used for usability testing and user experience research. Users are observed in a specific environment while interacting with a product or system.